Scott Bailey, associate professor of theriogenology. Annie Eldridge puts her heart and soul into Settlers’ Run, her horse farm in Vass, N.C., and it means a lot to her when others care of her horses as much as she does. So when she found kindred spirits at the NC State Veterinary Hospital, she did something special. 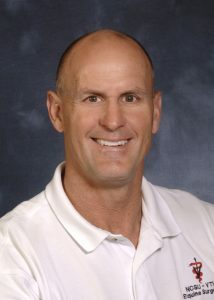 Rich Redding, clinical professor of equine orthopedics and lameness. 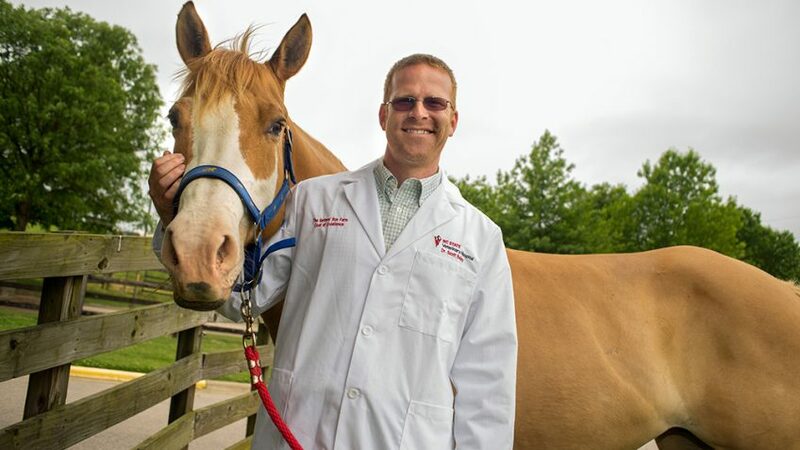 Last month, Eldridge presented Rich Redding, clinical professor of equine orthopedics and lameness, with a Coat of Excellence, a white lab coat honoring a faculty or staff member who profoundly touches the lives of an animal patient and owner. The coat, part of a $10,000 donation to the North Carolina Veterinary Medical Foundation, is embroidered with the name of the honoree and the animal or client. Because Setters’ Run Farm has both breeding and eventing horse training programs, Redding deals with both the younger horse developmental problems and adult horse competition injuries. He estimates that each year he performs surgery on about six of Eldridge’s horses. This is the second time Eldridge has recognized a clinician with a Coat of Excellence. In 2015, she presented one to associate professor of theriogenology Scott Bailey, who has closely worked with Eldridge in the hospital’s equine reproduction service. Bailey and his team, Eldridge said, has helped her mares produce 15 foals over the past five years. “No case is too difficult for him,” Eldridge said of Bailey. Bailey called Eldridge an amazing horsewoman with a wonderful vision for her mares. Eldridge has worked hard to develop her program on Setters’ Run Farm, which is named after her four English setters. Once an event rider herself, Eldridge has had health issues that forced her to retire from competition in 2009. Since then, she has been devoted to her horse farm. Eldridge is grateful to NC State’s equine team for helping her get to where she is today.